This is the 10 oz package size that retail through supermarkets and gourmet food stores. These coffees will be fresh. Unopened they should be good for many months. Great for Gifts! Note: Coupon codes do not apply to this item. We GUARANTEE these coffees. If you are unhappy with the quality of the coffees you can return any unused coffee for a full refund. 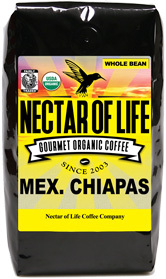 Americana is an exquisite blend of 100% shade grown, certified Organic, Fair Trade gourmet coffees from the Americas. Most of the coffees in this blend are Strictly Hard Bean (SHB), or Strictly High Grown (SHG) and were grown at elevations of over 4500ft. Coffees grown at high elevations develop more slowly resulting in a dense bean structure and complex flavors. Roasted to a light/medium roast, this blend is clean and bright. It shows floral and citrus notes, followed by a smooth nutty vanilla flavor. We pride ourselves on our organic Colombian coffee. We source only the finest organic Fair Trade Colombian coffees possible then roast them to our unique dark Chocolate Roast™. 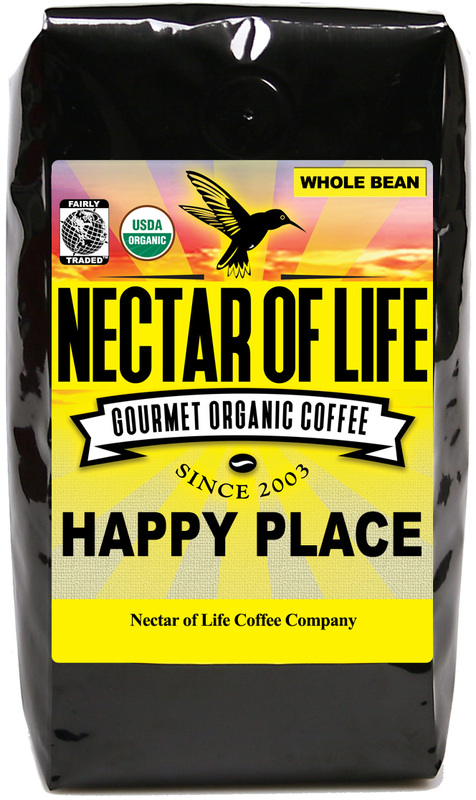 Nectar of Life Colombian is a dark roasted, full-bodied excelso grade 100% organic, 100% Fair Trade coffee. It is a huge, mouth-filling blend with the classic gourmet Colombian flavor profile. It finishes with a lush cocoa quality. Fresh roasted per order. We've had many, many people hail our French Roast as the best they've ever had. We start out with the biggest, most full-bodied Idonesian coffees we can find. Then we source the finest Strictly High Grown (SHG) South American coffees for added complexity and structure. These coffees are roasted to the very edge, resulting in a shiny black HUGE complex coffee that will make the French Roast lover weep (with joy!). The name says it all! This dark roasted blend of shade grown, organic, Fair Trade gourmet coffees from around the world will knock your socks off! When times get hectic indulge in this exquisite, dark-roasted coffee, and you too can slip away to your Happy Place! This is the finest organic, Fair Trade breakfast blend on the market! Comprised of Indonesian and Central American coffees this blend is complex and robust. We roast the coffees to different roast levels prior to blending resulting in a medium/dark roasted coffee that is so full of flavor it will knock your socks off! Sumatran coffee is arguably the most full-bodied, flavorful coffee in the world, and this blend from the Gayoland region of Sumatra, Indonesia is a prime example. We roasted it to a deep, dark roast to unleash the full body and floral/earthy flavors that only an exceptional Sumatran coffee can provide. Taste it once and you won't go back! Nectar of Life Coffee Company knows coffee, and nothing portrays the purest essence of coffee than espresso. We started with the finest shade grown, organic, Fair Trade coffees we could find. Then we spent endless hours fine tuning our roast profiles and pulling shots, until we finally had it, the Ultimate Espresso! There really isn't a better espresso blend out there. If you're an espresso connoisseur you must try this!